Our amazing prize draws are becoming more and more popular and our latest Twitter Competition is to win this amazing Diesel wallet. The guys at Diesel kindly donated the wallet when we were last at their showroom in London buying collections for Spring Summer 2014. With the iconic “Only The Brave” embossed logo at the front and coin and note compartments inside, we think anyone would be happy carrying this in their back pocket. The above Tweet shows how easy it is to enter this brilliant Twitter Competition, simply follow @ApacheHorsham and ReTweet the message. This was only started yesterday and we’ve had an incredible response with over 200 new followers and reams of RT’s already. We think this might be one of the most successful Twitter Competitions we have run so far. The winner will be picked out at random on Wednesday 3rd July 2013. As we at Apache are far too kind to you all, we are also giving you another bonus entry route into our Twitter Competition. Simply subscribe by email to our blog and comment on this post for an extra entry into the draw. The last winner of our Twitter Competition won a fantastic Guide London Floral Shirt and we are awaiting a picture of the lucky winner donning his prize. 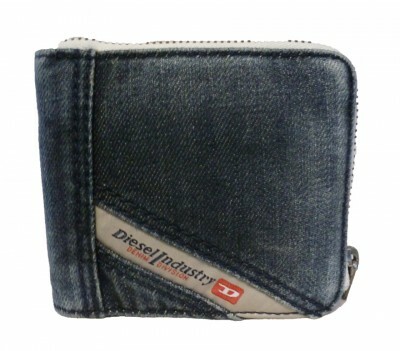 You could be as lucky as @KarlFoxley and win this lovely Diesel wallet. In the meantime, why not check out our brand New Diesel Spring Summer 2013 Arrivals online at Apacheonline and if you don’t win, at least you can treat yourself to a Diesel Wallet at a great price. Good luck with the Twitter Competition guys, we all have our fingers crossed for you! Diesel Wallet, next Twitter Competition Prize? Thanks for the competition – the prize is brilliant. Just the thing for my lovely husband. Thanks Irene!! Good luck!! Im sure you would earn a few brownie points if you won this!! Thanks Suzie, remember to subscribe to the blog too and keep those fingers crossed!! Fab prize ! Have subscribed & Re-tweeted on twitter. Thanks Abigail, keep those fingers crossed and you never know!! Good Luck!! Subscribed and heres the comment. You know you want to give me this. Hi Ash! Nice to hear from you!! Good luck and keep those fingers crossed!! Thanks Darren, its a really cool wallet, good luck!! My money would be worth more in this baby! Hi Gtoner, thanks for the entry and good luck!! Lovely prize, would love to win this for my son, his birthday soon,, might even put some money in it too!!! Thanks DoeJany, keep your fingers crossed and you never know!! Good Luck!! Thanks Sonya, it is a great style and i might have had one myself a few years back!! Good Luck!! Thanks for your comment Emma!! Keep those fingers and toes crossed!! Good Luck!! Lovely wallet – just a shame it would be empty most of the time! Thanks DP!! Good luck and you never know, there might be some money in it if you win!! Thanks Claire, it is a lovely wallet!! Wishing you all the very best of luck!! Hi Danny and thanks for your entry!! One size fits all with a wallet!! lol! Great prize.My old one is just about knackered! Thanks Andrew, its a great wallet!! Good Luck!! Thanks Sharon, Keep those fingers crossed and your boyfriend might be a very happy man!! Good Luck!! Thanks Felicity, Good Luck with the competition, fingers crossed for your hubby!! Thank you Diane, im sure he would love this wallet!! Good luck and fingers crossed!! I need a new wallet and this will do just fine! Thanks Anthony! Keep those fingers crossed and you never know!! Good Luck!! Thank you Annaloa, Its a fantastic wallet!! Keep those fingers crossed!! Good Luck! Thanks J, good luck with the competition!! This would be a great gift for the other half! Thanks George, keep those fingers crossed!! My OH would love this as his has seen better years: over 30 of them!! Hi Marina, thanks for the entry!! Keep those fingers crossed!! Hi S, Good luck with the competition!! Thanks Barbara, we love this wallet too!! Sad to let it go!! Good Luck! Hi Julie, Thanks for your entry and good luck, you might make the hubby very happy!! This would be a great present for my husband for our anniversary this month! Hi Nicola, Thank you for your entry and good luck!! You would be in hubby’s good books!! Thanks Ruth and good luck with the competition!! You are very welcome Sam and good luck!! Great Prize, my Hubbie would love this. Thanks Jennifer and who knows, it could be you and your Hubby would be very happy!! Good Luck! Hi Sophie, good luck with the competition and keep those fingers and toes crossed!! Hi Danny, thanks for the entry and good luck!! Hi Debbie, thanks for the entry and good luck!! Your son would be chuffed!! My husband would love this, retweeting. Thanks Kerry, Good Luck!! Im sure he would especially if there was a few quid in it! !